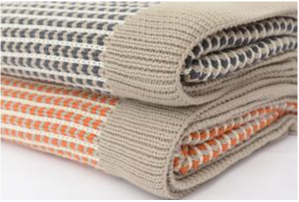 This Snuggly throw features an soft open weave that is at once warm and cozy as well as breathable and lush. Available in two colors, Orange & Tan Melange and Grey & Tan Melange which each coordinate seamlessly with many décor styles. 100% Cotton. Click here to check out our other great blankets too.